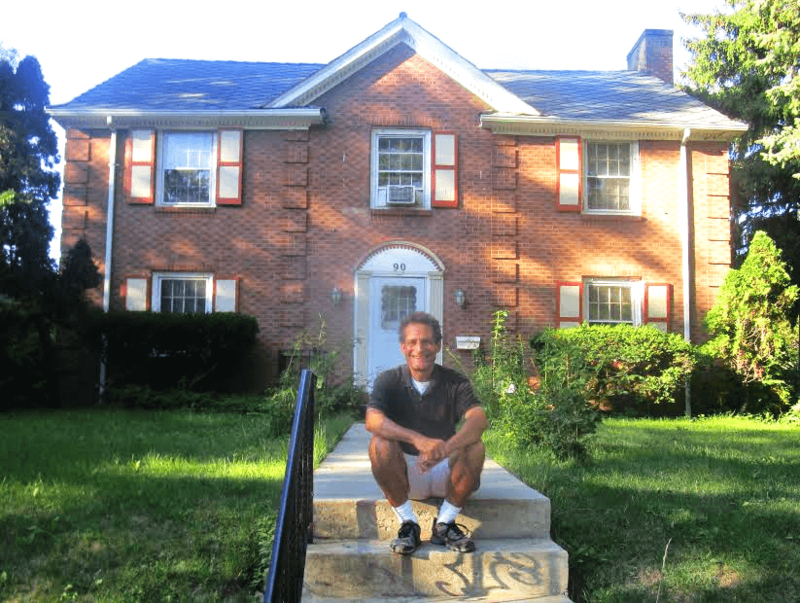 On Dr. Charles T. Lunsford and the house where he entertained Martin Luther King Jr. 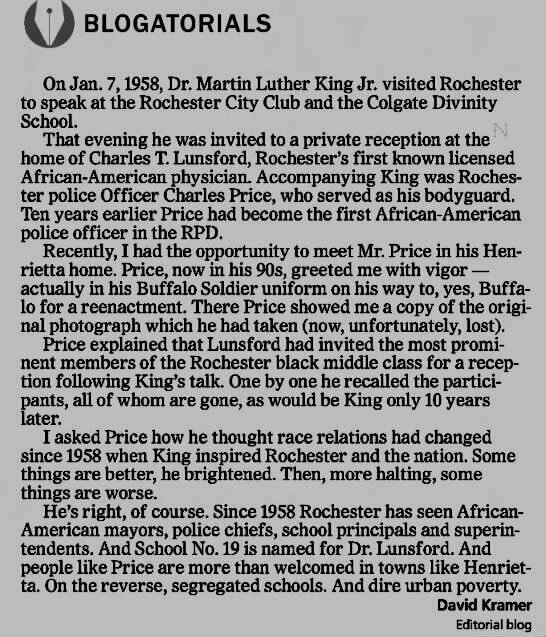 This Martin Luther King Day is a fitting time to look back on the extraordinary career of Dr. Charles T. Lunsford, Rochester’s first black physician, who entertained King when he visited Rochester on January 7th, 1958. This summer I went over to 90 Elmwood where I met the current owner, Robert, an architect with the City of Rochester. Robert did know about King’s visit. He confirmed that King did not stay the night, but spent several hours at a reception held by Lunsford and his wife Nan. I told Robert the story of meeting Mr. Price and being shown the photo. Robert smiled. He knew Charles quite well. They are both parishioners at the Mt. Olivet Baptist Church. And Robert was happy to report that Charles is still going strong. I also discovered a biography of Lunsford written in 2008 by then University of Rochester undergraduate Bennett Parmington. After the photos is the biography along with accompanying clippings from the Democrat and Chronicle. The footnotes are omitted but can be found in the full text. Dr. Charles Terrell Lunsford (1891-1985) was born in Macon, Georgia in 1891. He attended Howard University in Washington, D.C. after having moved there when he was 15. He moved to Rochester in the summer of 1921 and opened his own practice. Dr. Lunsford was a pioneer of civil rights for African-Americans. 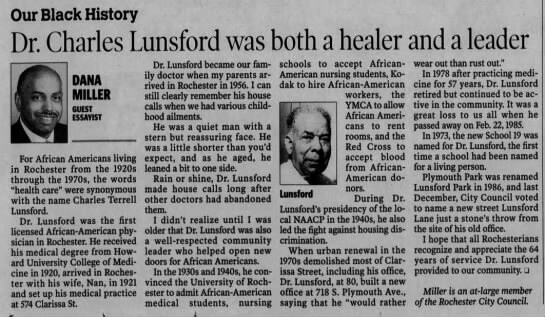 He worked with and sometimes against the YMCA, the Red Cross, the Eastman Kodak Company, and the University of Rochester’s Medical School in order to abolish discriminatory practices.The Rochester School Board renamed School 19 as the Charles T. Lunsford School in 1973. On June 18th, 1978 the Mayor Thomas Ryan declared the day Charles T. Lunsford Day in Rochester. Finally, in 1986, the Rochester City Council renamed Plymouth Park to Charles Lunsford Park. Dr. Lunsford’s grandmother had been in intimate relations with her master during slavery times in Georgia. This relationship produced three children overall, and all of the children took the master’s name of Lunsford. When Charles Lunsford was 15 he moved from Macon, Georgia to Washington, D.C. to attend an all black institution by the name of Howard Prep School, and from there, he went on to attend Howard University where he received both a bachelor’s degree and, in 1913, a medical degree. After serving an internship at Freedman’s Hospital in Washington, D.C he moved to Rochester in 1921 due to urgings from locals whom he knew. On July 11, 1921, Monroe County Clerk James L. Hotchkiss signed a Physicians and Surgeon’s Certificate that allowed Dr. Lunsford to practice medicine in Monroe County. 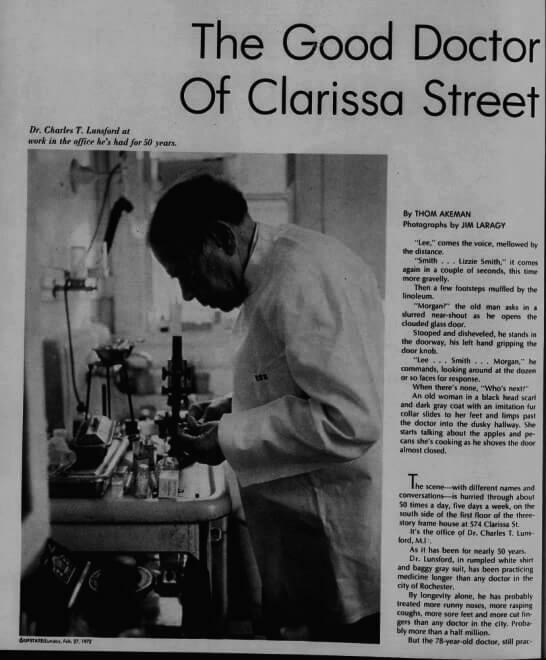 In the summer of 1921, Dr. Lunsford opened a private practice at 574 Clarissa St. this was the first medical practice to be owned or operated by an African-American in Rochester. 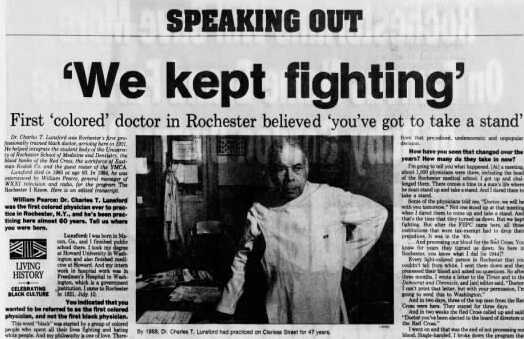 Just a few months after arriving in Rochester, Dr. Lunsford diagnosed a case of small pox infection, and the current medical examiner credited him with saving the city from epidemic. A few years after arriving in Rochester Dr. Lunsford was appointed to the staff of Rochester General Hospital and St. Mary’s Hospital. During this time Dr. Lunsford moved his practice to 718 South Plymouth Ave. 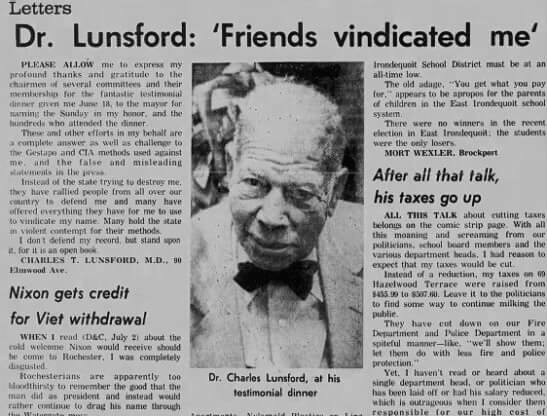 In Rochester, Dr. Lunsford was also a pioneer in civil rights for African-Americans, and he had great successes during his career that brought equal rights for African-Americans in local and federal institutions. 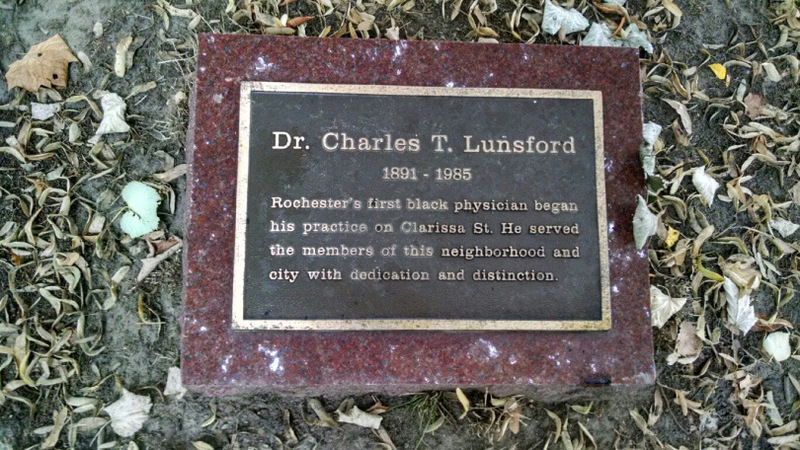 Upon arriving in Rochester, Dr. Lunsford was appalled at the fact that there were no black physicians and no black nurses in any Rochester hospitals. The first institution in Rochester to be scrutinized was the University of Rochester Medical School because of their policy of not enrolling any African-American medical students. He met with George Hoyt Whipple, founding dean of the Medical School in order to discuss his views and push for integration. After many confrontations with the school administration, the first black medical student, Edwin A. Robinson, graduated in 1945 and went on to become a surgeon at Highland Hospital. The next racial battle that Dr. Lunsford would initiate was with the Eastman Kodak Company. 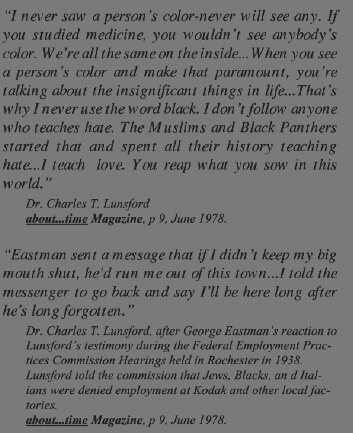 Dr. Lunsford charged Eastman Kodak Company with racial discrimination against blacks and immigrants saying that it was unlawful to restrict blacks to certain seats in the Eastman Theater. He also exposed discrimination in the company by citing Jews and Italians who had applied for jobs at the Eastman Kodak Company, and been turned down, only to adopt Anglo-Saxon last names and then be hired. Dr. Lunsford also set out to change the Red Cross. In 1944, he noted that there was a Red Cross policy in effect that turned away blood donations from blacks during the wartime blood drives, and Lunsford decided that a change was needed. He sent 50 light skinned black patients who were able to pass for white to the local blood bank where their blood was taken and processed with no complaints. 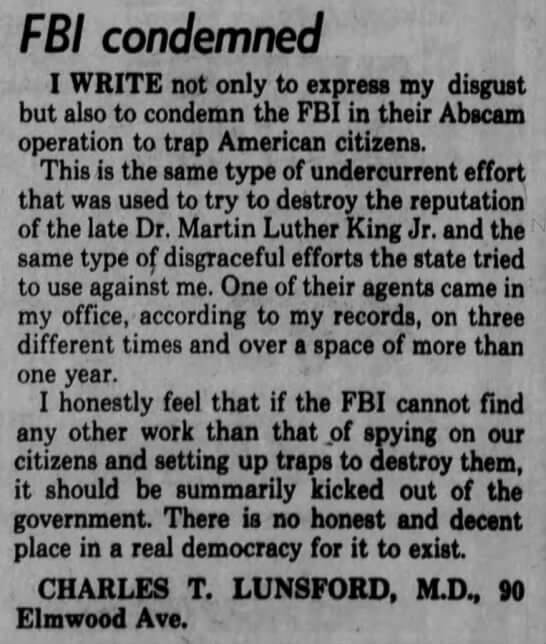 Only later did Dr. Lunsford in a letter to the editor of the Democrat and Chronicle, described his actions and the obvious discrimination taking place. The letter was then sent to the national Red Cross headquarters. Within weeks national Red Cross officials came from Washington to discuss the matter with Dr. Lunsford; he stated to them that by now there must be approximately 100,000 light skinned black blood donors and that it was ridiculous to segregate such a thing. After a few days of deliberation, the organization’s discriminatory practice was overturned, and Dr. Lunsford was appointed to the Red Cross executive committee in Rochester. The last organization that Dr. Lunsford dealt with was the local YMCA. After hearing of a well-known black singer being denied a room at the downtown YMCA, Dr. Lunsford went and spoke with Harper Sibley, head of the YMCA board. He was quoted as saying, “If you want to call it the Young Men’s Caucasian Society then that’s fine with me.” A few weeks later the YMCA repealed the policy and allowed black guests. Nearly a decade later, in 1972 three state undercover agents posed as patients in Dr. Lunsford’s office to observe his practice and, in 1976, a committee of the State Medical Board was convened, which charged Dr. Lunsford with failing to keep proper records of controlled substances that he distributed and for improperly prescribing amphetamine type diet pills to patients without cause. 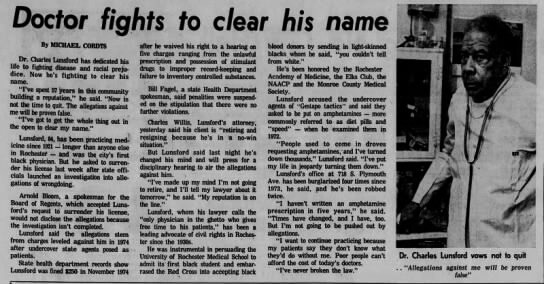 Dr. Lunsford believed that he had done nothing wrong but still, in 1978, he surrendered his medical license because of several factors including advice from his lawyers and friends, the health of his wife, and his concern for his own safety because he was receiving increased pressure from patients to give them drugs. Dr. Lunsford’s office on South Plymouth street had been broken into four times; he had been robbed in his office by a thief posing as a patient, and he had been confronted at gunpoint in another incident. Also he recalled an incident when people pretending to be physicians from out of state called his office and said that they were sending patients who needed to be treated with certain drugs. After all of this robbery and deception, Dr. Lunsford decided to stop practicing medicine for fear of his own life. As to the counts of not keeping inventory of controlled substances, it was noted that with Lunsford’s heavy patient load and lack of help in the way of nurses or secretaries, it was almost impossible to keep up with state inventory requirements. Dr. Lunsford always urged Rochester to live by his credo of love, brotherhood, tolerance, and good will. He embodied all of these virtues when providing health care to poor citizens of Rochester. He charged about 2 dollars for an office visit and worked day and night often traveling to patient’s homes to provide care. Moreover, in the 1960’s, debts owed by patients to Dr. Lunsford were substantial but he would never collect them. He was epitomized as having the philosophy of a country doctor because he took care of anybody, anytime, and anyplace. He was quoted as saying, “That’s my purpose.And that’s the real calling in life. The legacy left by Dr. Lunsford will not soon be forgotten because of the numerous awards and recognitions that he received during his life and even after his death. In 1958 he was recognized by the then Governor W. Averell Harriman for his work in bringing equality to public accommodations, jobs, and housing in Rochester. In 1959, he was cited for more than 35 years of service to the NAACP at a dinner in New York City . Dr. Lunsford was awarded the Rochester Museum and Science Center’s Civic Medal for his service to the community in 1974. 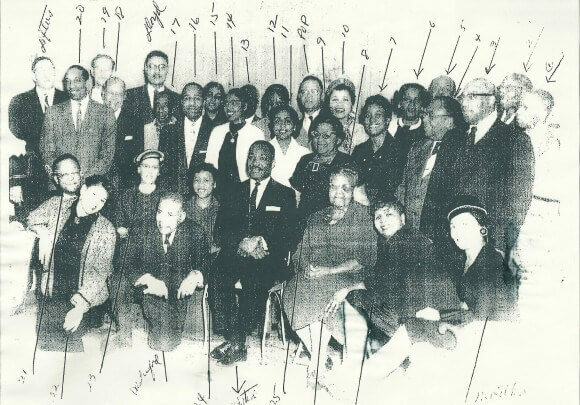 The Rochester Board of Education named the new School 19 the Charles T. Lunsford School in 1973, marking the first time the board had named a school after a living person. 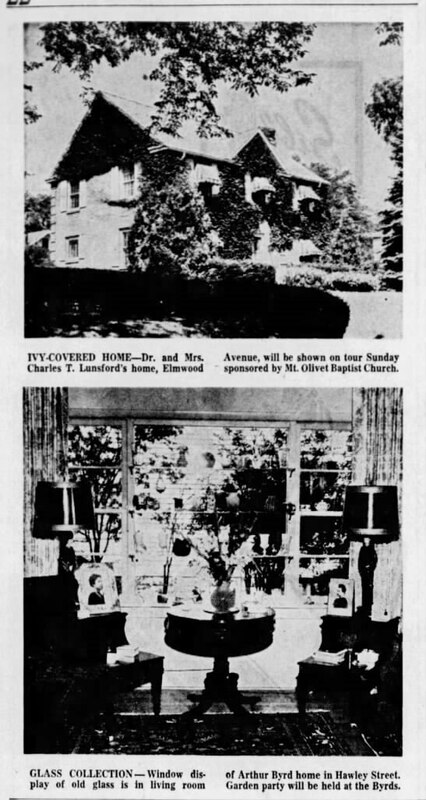 After retiring in 1978, a testimonial dinner was held to recognize Dr. Lunsford at the Mapledale Party House, which over 1000 guests attended. On June 18th, 1978 the then Mayor Thomas P. Ryan Jr. declared that day as Charles T. Lunsford Day in Rochester. Also in 1978 the Urban League of Rochester established the Charles T. Lunsford Distinguished Community Service Award to be given annually in honor of Dr. Lunsford (Dr. Lunsford honored 3). Finally, on April 22nd, 1985 the University of Rochester created a fellowship to cover tuition and fees for the full four years of study at UR’s Medical School, for black students selected on basis of need and professional potential. In 1986, Rochester City Council voted to rename Plymouth Park, the location of the Corn Hill gazebo, Lunsford Park. The park is located near Frederick Douglass Street and Edinburgh Street, just a few blocks from Lunsford’s former office on Clarissa Street. The effort was sponsored by The Third Ward Urban Renewal Advisory Committee. 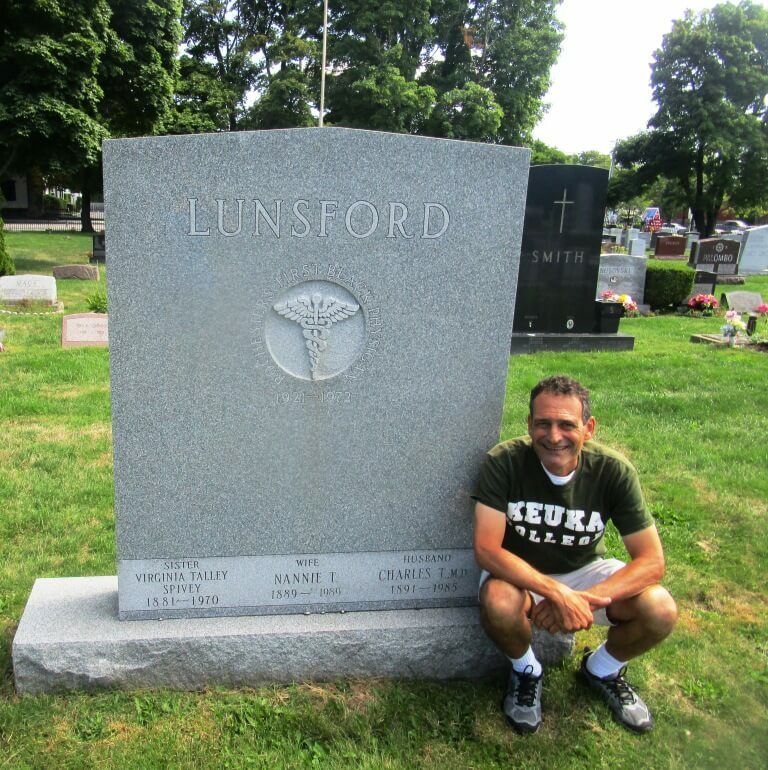 Dr. Lunsford died February 26th, 1985, at age 93 from bronchial pneumonia in Strong Memorial Hospital.